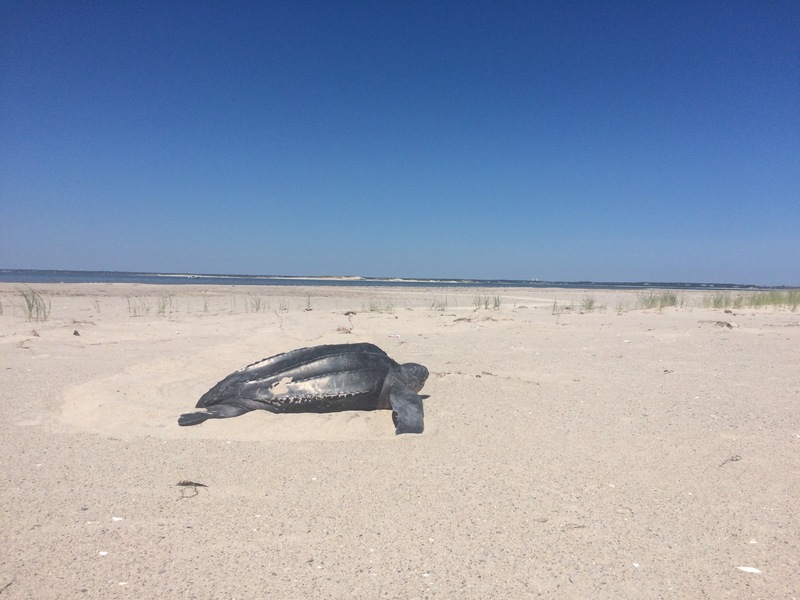 Although the end of the season blues were running at Monomoy last Friday, it turned out that there was one more surpise in store for the team: rescuing a 500 pound leatherback sea turtle that had been stranded on South Beach. The turtle was mot likely stranded during the previous night’s full moon high tide, and was first called in by some quahoggers heading out to the bay between Monomoy and South Beach. After locating the leatherback, Kate made calls to IFAW and the New England Aquarium to pass on the news- but quickly found out that due to tidal restrictions and travel time, it wouldn’t be until late in the day, or possibly even the next morning, before teams from either of those institutions could make it to the island. And so, being pragmatic island dwellers, we set about rescuing the turtle ourselves. So how exactly do you rescue a 500 pound sea creature? Keeping it cool was a logical place to start. While the leatherback’s smooth, black carapace and skin are great for keeping up an incredible speed in the water with minimum effort, on a sunny beach in August they effectively become a portable sauna. Armed with only a tiny bucket and a deep sympathy for having been left out in the sun for too long, I headed down to the bay to pick up water, quart by quart to sprinkle on the turtle. Next step: face our turtle towards the water. Although female leatherbacks emerge from the water to lay their eggs, they do so at night, and usually on the ocean side of beaches, so the sound of breaking waves and reflection of light on the water is a beacon signalling the path to freedom. Perhaps because of the unusual location that this turtle washed up on, it appeared that it was trying to head across South Beach towards the sound of the ocean, but still about 300 meters away over sadn, dune grass, and a significant hill for an animal adapted to spend its life in the sea. Instead, we hoped that we could turn the turtle around towards the bay that it came from- only about 20 meters away, and downhill. To do this, we stood with the turtle between us and the water, hoping that our presence would help turn it towards the bay. Step three: Involve the public! Two people had boated over from Harwichport to dig for clams, and after seeing how small our bucket was in comparison to the size fo the turtle we had, we decided to ask for their help. Turns out, they were already on their way, buckets in hand, to see what they could do to help. Public involvement in conservation biology: check. While all this had been going on, Kate and Ivan had bravely led an expedition back to the mainland to get a tarp, the idea being that we could load the leatherback into a sling in order to pick it up and carry it. Arriving back with the floor of our trusty Weatherport (Not a sponsored link: weatherport.com), we then faced the hurdle of trying to load the turtle onto it. Dig, stretch, rock, wriggle, nudge, dig a little more, tug, wiggle, push: eventually the leatherback was on the sling and ready to move. Sliding over the sand, our team of 8 skidded the sling towards the ocean side of South Beach. Despite our attempts to revive it on land, it had been apparent that all the time out of the water had taken a toll on our magnificent acquaintance. Throughout the whole process of watering, nudging, and loading, it had barely moved itself out of our way. Once the ocean was in sight and the sound of crashing waves could reach us, though, the leatherback took a heroic step and started moving towards the sound on its own. Still constrained by the tarp, this consisted mostly of some fin flapping and mouth snapping, but we were relieved to see the turtle realize that its home was so close. As we all paraded into the surf, the turtle floated a few seconds and then was off, diving into the blue as we watched and cheered it on. For a few minutes it rested near the surface just beyond the surf, then surfaced for air one last time before disappearing. We might never see it again, but it’s amazing to think thast this turtle will probably live longer than any of us who helped rescue it.